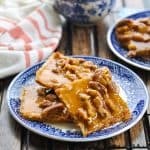 These 4-Ingredient Graham Cracker Toffee Bars with pecans are the perfect dessert to share with friends -- and they only require about 5 minutes of prep! Line a rimmed baking sheet with aluminum foil and spray with cooking spray. Place graham crackers on prepared baking sheet; set aside. In a small saucepan over low heat, melt butter. Add brown sugar and pecans. Boil for 2 minutes, stirring constantly. Spread mixture evenly over graham crackers. Bake for 10 minutes. Cut crackers into squares while they are still warm. Allow to completely cool before removing from baking sheet. These bars keep well in an air-tight container for about 5 days. For a simple variation, try using chopped almonds or peanuts instead of the pecans. I recommend using the salted butter to give the dessert a great salty-and-sweet flavor combination.